← [Monthversary Lottery ] The list of winners! Throughout this Anniversary month, small fairies like the FeerikGames logo slipped into some the OhMyDollz events. There were 31 fairies to collect, one for each day of the month. The fairies you collected will allow you to win gifts! The more fairies you have, the more $$$ and old gifts from the enigmas’ quest! Important: You will only win the gift inside the scale you are. The different gift’s scales do not add up. Reminder: the gifts distributed by the fairies will depend on the number of different faeries you have in your inventory. 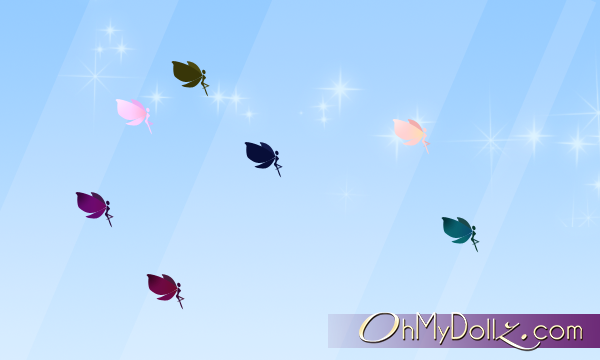 Each fairy has a different color, there are 31 to collect to get a maximum of gifts! Congratulations to all the players for your hunt!